We all like to impress the ladies, especially the ones that pick us up from whisky club on all occasions. 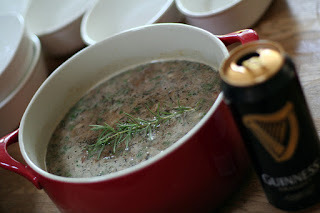 To carry on with the many recipes I have blogged up over time, the recent post by The Colonel-in-Chief on his Beef and Guinness Pie (which was served at the most recent Whisky Club) has prompted me to complete a post I started many moons ago for a Beef and Stout Pie I make regularly and I made for 2011 Saint Patrick's Day Whisky Celebrations. Thanks for the nudge Colonel. Ok so this does not have any whisky in it but it does how our favourite undistilled whisky: Beer. Now my recipe is actually pretty close in quantity to The Colonels save variations based on sweetness (see more at the end of this post). I have as usual broken this down quite extensively for the none cooks of the group and hope this is enough. 1. Dice beef into bite sized cubes remembering beef will reduce in size so a little bigger is better. I choose Rump because of the flavour but you could use a round steak or gravy steak depending on your fancy. Blade steak can be ok but needs some good tenderising on a slow heat. Season with salt and dust with some of the flour. Meanwhile ensure fry pan is heated and it is adequate in size. If you are using a stovetop pressure cooker simply fry in pot. 2. Brown beef cubes in fry pan. Do not cook through you are only looking to brown the outside. Browning the beef firstly keeps in the juices but more importantly it makes the beef nice and dark in colour. 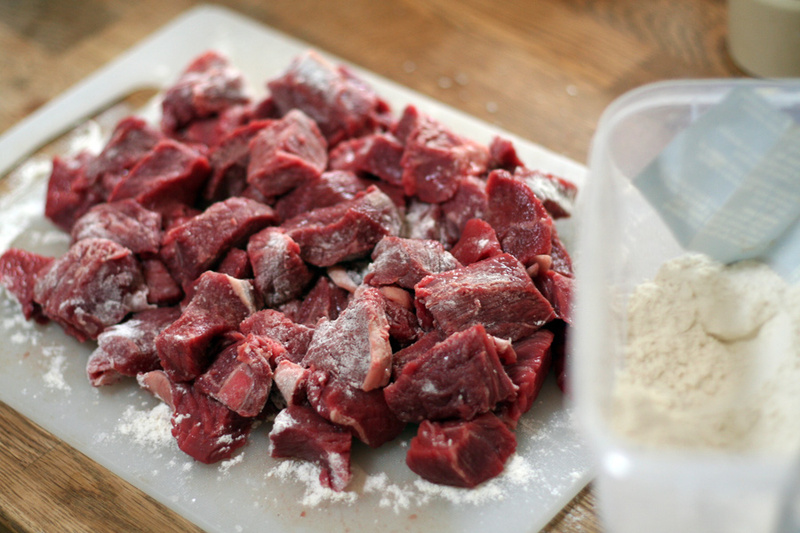 Adding the beef straight to the pot with liquid will retain the redness of the beef and Beef and Stout Pie always looks better with a dark meat. The flour is going to work as a thickener also when stewing in the pressure cooker. Brown that beef off. Bits of pink is fine, red and bleeding is bad. 3a. For Pressure Cooker method: Transfer meat to pressure cooker and add the 2 cups of beef stock. 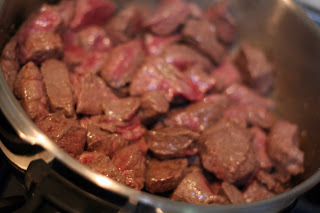 Cook for 25min and beef will be tender and break apart easily by this time. 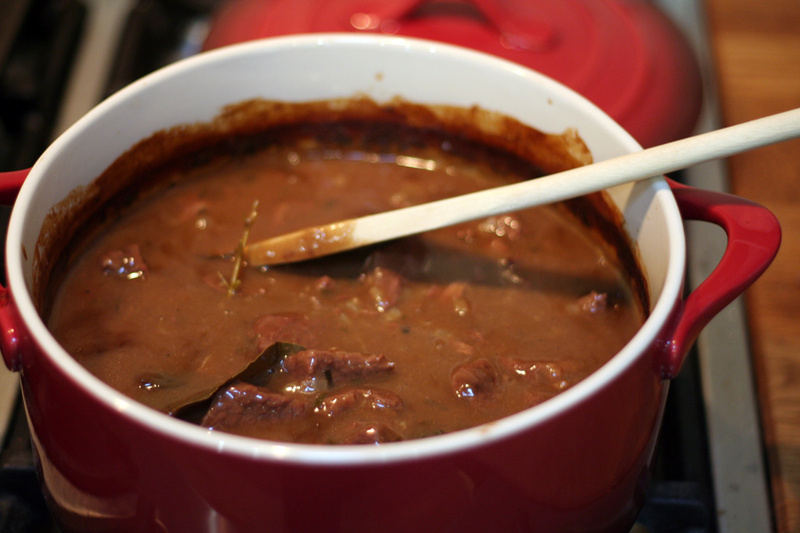 Once beef is cooked transfer beef and liquid into slow cooker or into large oven pot. 3b. For Slow Cooker method: Transfer beef into slow cooker with beef stock ready for other ingredients. Ensure slow cooker is heating at this stage. 4. 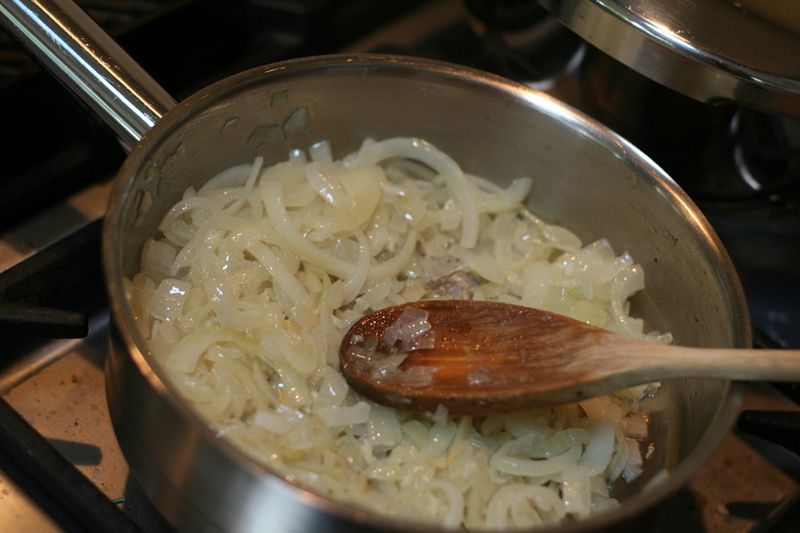 While beef is browning add onion to separate fry pan with a small amount of oil to slick surface. Sweat onions on low to medium heat until onion becomes transparent (not brown). Sweeting the onions will sweeten without burning them. When onion is complete make a small well in centre and add crushed garlic. and cook for 30sec to 1 minute. 30sec is enough to sweeten the garlic and take out the heat and pungency. Mixed through onion and then transfer onion into Baking Pot / Slow Cooker. I use a combination of sliced and diced for good reason. Sliced gives texture and body to the stew while the diced breaks down and absorbs into the sauce. 5. 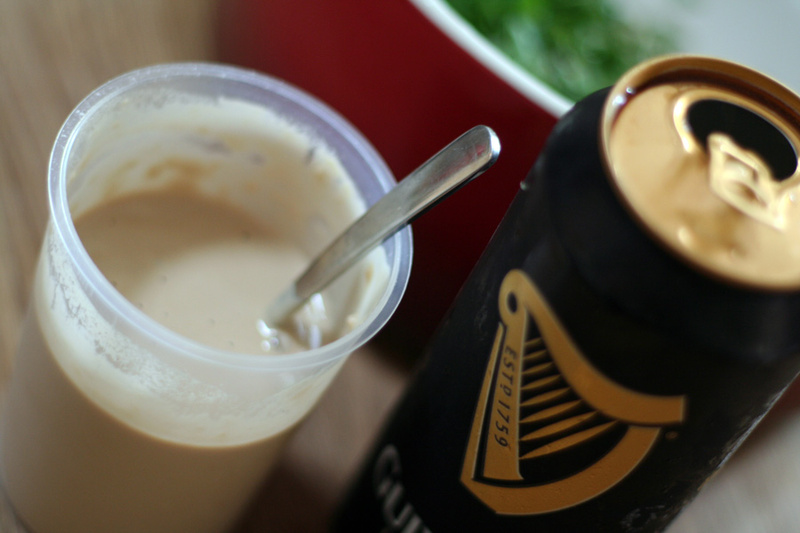 Take remaining flour (should be still near half a cup), open stout and pour a small measure in and mix to make a paste. Keep adding liquid until fully blended with no lumps. Note to you non-cooks out there that there is more than enough beef stock and stout so you should never been needing water (don't drink the beer). Flour needs to be mixed only with cold liquid or it will start to form into dough and you are buggered so just use your beer and your guaranteed success. The flour is for thickening the stew. Once fully mixed add flower/beer mix and any remaining beer to Oven Pot / Slow Cooker and stir with any pre-added ingredients. The ladies like the green as it means healthy. Note: herbs are not grass clippings. 6. 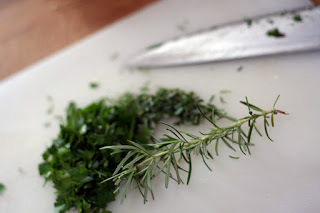 Beef loves rosemary so you want half the herb fine shopped without stalk and added to the Oven Pot / Slow Cooker. Add the 2nd sprig of rosemary whole including leaves to the Oven Pot / Slow Cooker to extract some of the oils from the stalk on baking. Rough chop parley and add to Oven Pot / Slow Cooker. Through in whole Bay Leaf. Taste and if you need pepper or additional salt to taste. You should not need any more salt at this stage. Note all above steps can be completed the night before and stored in fridge ready for transfer to slow cooker the next day. Just don't bother heating the slow cooker until you are ready to cook. Same goes for using the oven pot for pre-day prep. Ready for the oven. If your stew is not looking like this your in trouble. 7a. Your stew now needs to do its slow and lovely job. If you are using a slow cooker but have not used a pressure cooker this will take a good 8hrs on low. The stew will thicken and you should not need to stir but if you are around then always good to pop your nose in and give it stir anyway. 7b. If your using an oven pot but did not use a pressure cooker you will need a minimum of 4hrs at 170º (or a bit lower just gently bubbling away). Adjust temp as needed but remember if it went in stone cold from fridge you may need to quickly heat on stove top first or it is at least another 30min on high in oven just to get it warmed up if your lucky. 7c. If you used a pressure cooker in the early stages then you need not bake any longer than 2hrs in the oven to stew and thicken. If you are going to use a slow cooker 4hrs on low should be enough. Just remember your beef is already very tender so any vigorous boiling or stirring will break it apart. 8. 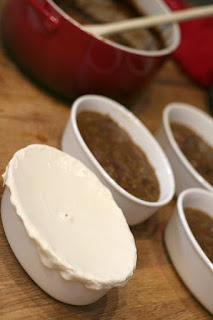 Once your stew is ready transfer hot contents to smaller pie / ramekin pots. Make sure they are clean of dust and no pre-oiling is needed. Only fill to 3/4 full as contents will bubble and with moisten the puff pastry if they come into contact with each other (not good). Clean lip of any spillage. If you are just going to use the larger pot for your pie then just leave it in it and proceed to next step. I sometimes do this but I ensure the larger pot is low enough to not have top much air space in the top and not too wide not to be able to get the puff pastry over the top. 9. 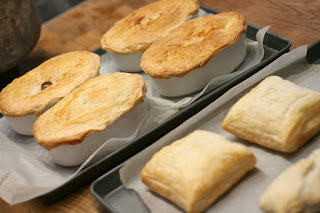 Cut softened puff pastry to size of each pie pot. Easy enough to do provided you have an extra empty pot to pre-cut around by turning it upside down. Give about 1cm extra around the outside s you will need this to roll over the lip. 11. This is where you need to work quick as the pie will start to soften the puff pastry. Flop your puff pastry over the top of the pot(s) and pinch the edges onto the lip. Get a reasonably good grab so it does not fall off. 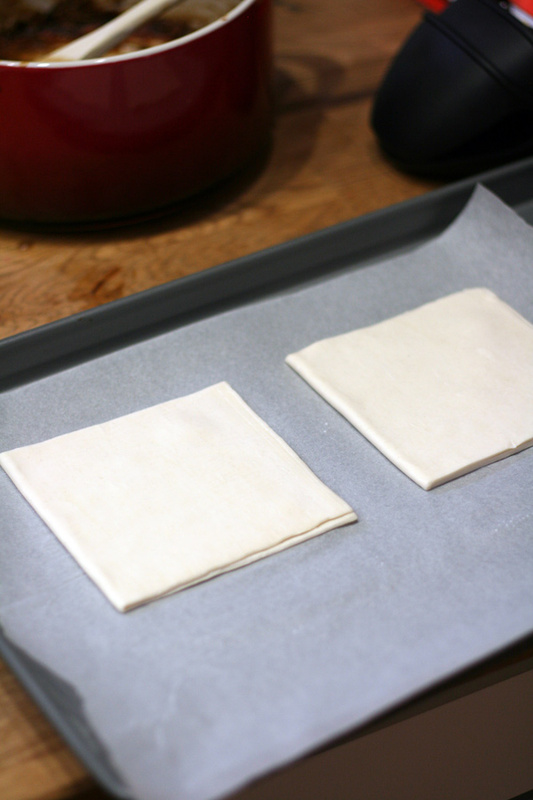 Quickly pinch (if you can) and slice the centre of the puff pastry to make a small hole to let put the moister. The whole only has to be small so if it begins to sag just stick the knife in to make the small whole. Brush the tops of the puff pastry with the egg so it gets a nice golden colour. Falling short you dripped your egg or it was off some milk will do a similar thing. 12. Add your pies into a medium to hot oven at 200º and bake 25min or until tops a crisp and golden. DO NOT BURN as the ladies will not be impressed. 13. Serve with side of cabbage (see below) a table whisky or a beer of choice (the same stout used in stew is best etiquette). You may have left over pastry or even a few full sheets. This is a good thing. Take a full sheet and cut it in half. Brush one side with egg and then fold onto of itself and press down. Brush top with more egg. Lay on flat baking tray and place in oven with your pie(s) during step 12. You will end up with some fantastic looking puff pillows extra for moping up the stew. This is also a great method for when you can only make a single large pot due to space constraints and it means more pie tops for everyone! I also find this recipe goes great with a side of cabbage. Simply take a 1/4 cabbage and slice into slivers. Add to a medium pot just large enough to take the ingredients and fill with cold water and at least a 1/4 cup of vinegar and a table spoon of sugar. bring to boil and allow to boil for at least 10min to 15min depending on how crunchy or soft you like your cabbage. Delicious! A side of potato mash is always a nice option as well. So a little about the use of stout and sugars. You may note in The Colonels recipe the addition is smokey BBQ sauce and tomato paste. There is nothing wrong with varying your recipe to suite your tastes. This recipe I created is quite earthy and strong. You can add some plum jam and or brown sugar if you want to sweeten it up more but I do emphasise moderation until you know what you are doing. BBQ sauce is full of brown sugar so you may in fact need to balance it with some additional salt, verses if you use tomato paste you will need to balance it with sugar because it can be full of salt and it will be too acidic. Regarding which stout to use, just use then you like most (it does not have to be Guinness). Some stouts are sweet while some stouts are dry so you go for what you like. You can even do this recipe with an Old, Porter or even a heavier English Bitter Ale like a creamy Boddingtons. For the woman wooing whisky enthusiast and dapper dans, man up to the challenge. Enjoy!